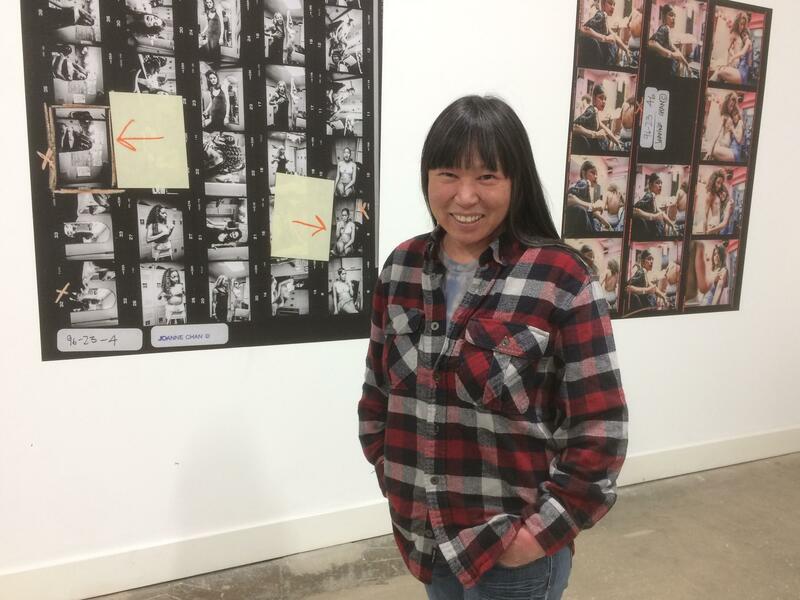 Joanne Chan inside her exhibition at Revolve. So she did. That was in 1990, and Chan devoted handfuls of nights over the next six years to shooting photos inside the dressings rooms of some of New York City’s adult entertainment clubs. An exhibition of that work, titled “New York By Night,” is on view through March at Revolve, in Asheville’s RAMP Studios. “It was like walking down in a rabbit hole, It was dark, gritty and very cinematic, and I was fascinated,” Chan said of shooting inside those nightclubs. Chan is a native of Hong Kong who, at age 11, moved with her mother to Queens, N.Y. She was enrolled in a basic photography course at Cooper Union College when she began shooting these photos. At the time, she didn’t them as particularly special. Chan’s photos show the women relaxed in various states of undress, often seemingly unaware or uncaring of Chan’s presence. Chan never exhibited this body outside contributions to a couple of group exhibitions in New York. Instead, Chan gravitated toward commercial and freelance photography. Over the years, she shot portraits for Guitar World and Vibe magazines and, for a number of years, took assignments from the New York Times. Often, she didn’t recognize the celebrities at the other end of her lens. Chan and her husband, the printmaker Rocky Kenworthy, and their daughter moved to Asheville eight years ago at Kenworthy’s suggestion. While Chan continued selling her photography to stock services, the move inspired a new creative direction, into crafts and also painting what she calls “depressing landscapes.” She hasn’t taken photos in more than four years. As for the women in the photos Chan took a quarter-century ago, she still keeps in touch with one through Facebook.